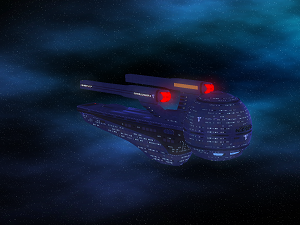 The USS Hippocrates is an Olympic Class Heavy Cruiser that was launched in 2374 as a hospital ship. With the growing threat of the Borg Collective, the break down in the Khitomer Accords ending the longstanding peace between the Federation and the Klingon Empire, and the rising threat from the Dominion the early 2370s were a time of great uncertainty in the Alpha Quadrant. While a strong emphasis remained on diplomatic overtures to maintain the peace, due to the danger of possibility of coming violence Starfleet chose to renew construction on the Olympic Class Heavy Cruiser to serve as a hospital ship. Construction was quickly approved with the third hull of this new wave of Olympic Class vessel being assigned the name Hippocrates. Construction began on Stardate 49170 at Tranquility Base with a projected launch date of Stardate 52900. When the Cardassian Union announced that they had joined the Dominion on Stardate 50564, and the Dominion War began less than 4 months later, construction was accelerated. The Hippocrates was launched on Stardate 51225 and was assigned to the 9th Fleet nearly a full year before its projected completion date. The Hippocrates, despite its assignment to the 9th Fleet, rarely saw open combat and traditionally remained on standby to respond to combat zones following the end of hostilities to provide care to the injured. This was beneficial as, due to its rushed construction, the Hippocrates faced frequent equipment and mechanical failures for much of its early career. The Hippocrates herself would not see combat until the First Battle of Chin'toka when the vessel was instrumental in defending the damaged IRW D'Trell from Cardassian Weapon Platforms. It would later provide emergency medical treatment to the crews of vessels lost in the attack. The Hippocrates would later be assigned to ferry cargo and support materials to the Chin'toka System during Starfleet's efforts to hold the system. During the return from one such run the Hippocrates was transferred to the 10th Fleet and diverted to Betazed to provide aid to the recently liberated world. This would ultimately result in the Hippocrates survival as the 9th Fleet was decimated in the Second Battle of Chin'toka a short time afterward. Hippocrates would remain at Betazed to assist with medical care and reconstruction efforts for nearly a decade following this transfer. Due to mounting issues the Hippocrates was returned to Tranquility Base to undergo refit in 2385 for two years. When returned to service the Hippocrates was sent to the Beta Quadrant as part of the 16th Fleet. Shortly afterward the Hobus Supernova Event of 2387 led the Hippocrates to participate in emergency efforts to assist the Romulan Star Empire following the loss of their homeworld. Hippocrates would provide assistance to the Romulans until the mid 2390s before being reassigned to the Sol Sector due to the growing threat of hostilities between the Federation and the Klingon Empire. 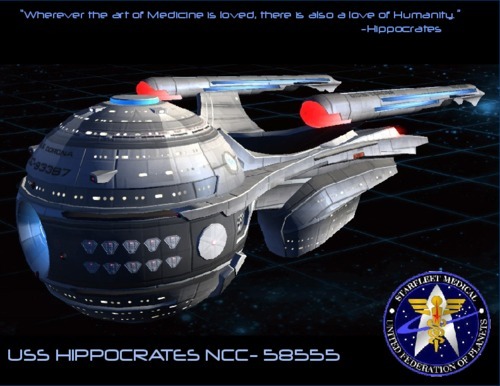 As part of its reassignment the Hippocrates would be assigned directly to Starfleet Medical to serve as a medical transport for the leadership of the agency until 2405 when the vessel was transferred to the 5th Fleet to provide medical support to combatants in the Archanis Sector. In 2409 the Hippocrates was severely damaged and taken to Starbase 24 for repairs; nonetheless, respite was not available as the Klingons attacked the outpost and caused more damage to the Hippocrates. This ended her career in the war and relegated her to the mothball fleet following her repairs. Due to the length of time she had remained in the mothball fleet Hippocrates was slated for full decommissioning in 2421. With the growing renaissance in exploration of the galaxy, Starfleet Medical Director Admiral Beatrix requested that the remaining Olympic Class vessels be upgraded once more to continue their operational service life. The Hippocrates was personally selected by Admiral Beatrix, whom had served upon her as part of her first assignment after becoming a Doctor, to participate in the upgrades and remain in the fleet. The vessel was relaunched from Antares Fleet Yard in 2425 under the command of Captain Celeste Graecen and assigned to the Maelstrom Sector. The USS Hippocrates was transferred from operations in the Maelstrom Sector to the Kotaba Sector in the Delta Quadrant in 2427 while on a special mission under the direct orders of Starfleet Commanding Officer Admiral William Teagarden. The USS Hippocrates is a Hospital ship that supports the Maelstrom Sector of the Alpha Quadrant. The crew, led by Captain Celeste Graecen has a specific route in which to perform their duties but often they are called on more perilous missions. The Hippocrates has been recently refit with the latest in medical technology and the crew is excited to see how it will perform. Unfortunately, their maiden mission did not go well. Captain Graecen is determined to perform better in future endeavors but has received a moral blow from the death of her uncle and the destruction of his crew. Not to mention their AI has developed some kind of fixation on experiencing emotions and has latched onto the crew to assist her in this endeavor. Will she succeed? Will the Hippocrates continue on their route to assist the Federation with its medical needs? Or will the crew stumble into disaster after disaster in their race to provide medical care for the Quadrant?